The Treasury Inspector General For Tax Administration (TIGTA) issued on September 21, 2018 a Report Reference Number: 2018-30-076 to the Commissioner of Internal Revenue concluding that the Internal Revenue Service Still Does Not Make Effective Use of Currency Transaction Reports. Highlights of Reference Number: 2018-30-076 to the Commissioner of Internal Revenue. 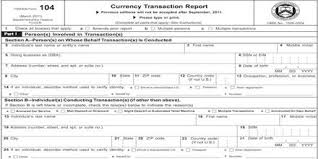 The Currency and Foreign Transactions Reporting Act of 1970, referred to as the Bank Secrecy Act, requires U.S. financial institutions to assist U.S. Government agencies by filing reports concerning currency transactions. One such report is known as the Currency Transaction Report (CTR), which financial institutions are required to file with the Financial Crimes Enforcement Network for currency transactions that exceed $10,000 or multiple currency transactions that aggregate more than $10,000 in a single day. Congress believed that the reports required by the Bank Secrecy Act, including the CTRs, would be useful for numerous purposes, including tax compliance purposes. TIGTA previously recommended that the IRS make greater use of CTR data to pursue potential nonfilers and underreporters, and the IRS agreed to the recommendation. This audit was initiated to determine how effectively the IRS uses CTR information to select and examine taxpayers. The IRS still makes no systemic use of CTR data in examinations. Although IRS management agreed with TIGTA’s recommendation in a September 2010 report and cited steps taken to develop examination referrals from the CTRs, the IRS is still not systemically using the CTRs to identify and pursue potentially noncompliant individuals. It is also not effectively tracking information referrals from Bank Secrecy Act examiners to the Examination function. Finally, some examiners are not documenting that they are considering available CTR information in their audits. During the fieldwork for this review, TIGTA also found that CTR data stored in the Integrated Data Retrieval System incorrectly aggregated CTR amounts for multiple individuals and showed the same CTRs total dollar amount for these individuals. We have initiated a follow-up audit to determine the extent and potential causes of this issue. Clarify formal Internal Revenue Manual procedures to assist examiners in their consideration of CTR data in examinations. 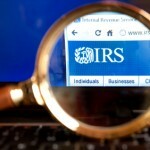 IRS management agreed with the recommendations and plans to take corrective actions.